For this pendant, I make use of black freshwater pearl as its centerpiece. 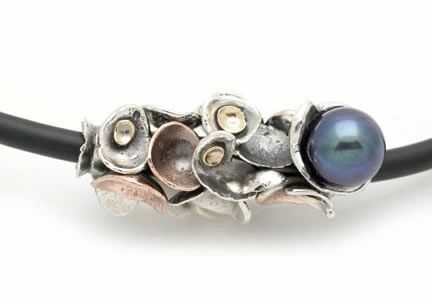 Sterling silver and copper metal pieces are used as a backdrop to the fine pearl. I also added 18k gold to further enhance the piece. A rubber cord holds all the elements together, and silver clasp locks the necklace.